RYAN Holman will take three generations of Australian football heritage on to Hobart's Bellerive Oval when he runs out for Queensland against Tasmania. The 20-year old midfielder has represented Queensland through all grades since earning an under-12 maroon jersey while at primary school at Goondiwindi. 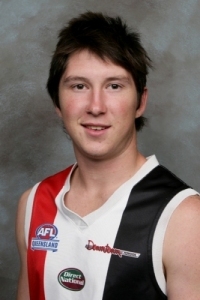 He's been playing senior football for QAFL club Morningside for the past four years and was one of the best afield in last year's grand final, leading to selection in the Queensland team for tomorrow's match. The Holman family name is synonymous with Australian football in southwest Queensland where they farmed just over the NSW border near Moree. For 20 years, Ryan's father Mark, uncle Peter and grandfather Phil were heavily involved with the Goondiwindi Hawks who contested 15 grand finals and won seven flags in a Darling Downs competition that extended from Goondiwindi to Gatton. For Mark and Peter Holman, who had been prominent players in the SANFL for Port Adelaide and North Adelaide respectively, the shift to farming in the eastern states was a major move. "Our parents were a second generation farming family on the Eyre Peninsula in South Australia," said Mark. "Dad was heavily involved in playing footy in the district and later became president of the local league. "That's just what you did down there. You played footy, lived and breathed it." After completing his schooling at Adelaide's Immanuel College, Mark went to university and attained a teaching degree. But it was back to the bush for he and brother Peter who worked on the family property in South Australia until a move to northern NSW in 1979. "The Goondiwindi team played in a northern NSW competition when we arrived, but they shifted to the Darling Downs AFL competition in 1980," Mark said. "We started playing with the club, trying to juggle farm life with the tremendous travelling involved. We'd spend a round trip of six hours to play a game. Because a lot of farmers were involved you wouldn't really know who was playing until you arrived at the game." Mark played for the Hawks until he was 29, then coached at the club for another three years. Phil, the family patriarch, is now retired in Toowoomba and is a life member of the Darling Downs AFL for his contribution to the game. The Holman Medal for the best player each year in the Darling Downs senior competition is named in the family's honour. "During the 20 years we were in Gundy the Hawks won seven premierships from 15 grand finals. We were in the heart of rugby league and rugby union country . . . .we've very proud of that record," Mark said. When Ryan finished primary school, already a state rep after being named best and fairest at the under-12 carnival in Cairns, the family moved to Brisbane. Ryan and his younger sisters started school at St Peter's Lutheran College, Indooroopilly, where Mark and his American-born wife Kim now work. Mark is ''head of coaches", an expansive position across 30 sports played by boys and girls at the school, while Kim is in charge of the boarding house where 180 students reside. Mark is also heavily involved in the AFLQ-backed scholarship scheme to St Peters which has produced talent such as Hervey Bay's Adam Spackman, a 2008 signing with the Brisbane Lions, and Hopevale's exciting prospect Rex Liddy. "The talent identification tracks boys in regional Queensland they come to board at St Peters to further their education and football," said Mark. 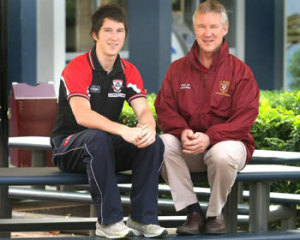 "We currently have two boys at the school who have just made the Queensland Under-16 team." In addition to his busy school commitments, Mark has also been assistant-coach to John Blair at Morningside for the past two seasons. 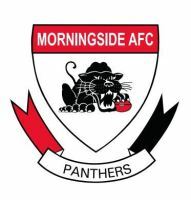 "I've always enjoyed coaching and the involvement at Morningside came through Jack Barry who was a regional development manager on the Downs when we were there," he said. Blair, the vastly experienced Morningside coach, believes Ryan Holman is good enough to play in the AFL and a strong showing tomorrow in Hobart could lead to an offer, as was the case with Mt Gravatt's Rohan Bell last year who was drafted by Melbourne as a mature age pick. "I had some pre-season time with the Gold Coast RAC Cup squad this year and hopefully there might be a draft opportunity from a club later in the year," said Ryan. He is one of nine players under 21 years of age who are in the Queensland side that is out to repeat its 2007 victory over the Tasmanians."